We’ve heard about life being created in a puddle of primordial chemical soup, sparked by lightning strikes, or organic molecules falling to Earth from comets or planets, such as Mars. But now, there is an alternative. Early Earth was radioactive; the Moon also had a lower orbit, generating strong tidal forces. Due to the close proximity to abundant water, radioactive beaches may have possessed all the essential ingredients for organic compounds, and eventually life, to thrive. Research by the University of Washington, Seattle, suggests that perhaps the highly radioactive environment of Earth some 4 billion years ago may have been the ideal time for life to form. The orbit of the Moon also had a part to play in this offbeat theory. Through strong tidal forces by a Moon that orbited far closer to the Earth than it does today, radioactive elements accumulated on the beaches could be gravitationally sorted. The chemical energy in these beach hot spots was probably high enough to allow self-sustaining fission processes (which occurs in natural concentrations of uranium). The main product from fission is heat, therefore powering chemical processes and the generation of organic, life-giving compounds. “Amino acids, sugars and [soluble] phosphate can all be produced simultaneously in a radioactive beach environment.” – Zachary Adam, an astrobiologist at the University of Washington Seattle. This is a hard theory to understand, it is well known that radioactivity breaks down organic molecules and causes a whole host of problems for us carbon-based creatures. But in the early Earth, devoid of plants and animals, radioactive processes may have provided energy for life to begin in the first place. This theory also partially explains why life may be a very rare occurrence in the universe: there must be the correct concentration of radioactive elements, on the surface of a water-dominated developing planet, with tidal forces supplied by a closely orbiting stellar body. The Earth may, after all, be unique. This discovery comes just in time to light up Christmas: new observations of the Northern Lights â€“ a spectacular phenomenon that lights up the night sky â€“ show them to be more intricate than previously thought. The Northern Lights were observed by NASA’s Time History of Events and Macroscale Interactions during Substorms (THEMIS), a system of ground cameras and five orbiting micro-satellites that work in combination to observe the phenomenon better than with a single satellite. This allowed scientists to map and understand the mechanisms of the Northern Lights better than before by giving them a 3D picture of the events. The Northern Lights or “Aurora Borealis” occur when charged particles coming from the Sun interact with the Earth’s magnetic field. THEMIS found evidence that there are magnetic “ropes” — long, wound magnetic field lines that resemble the braids of a rope â€“ connecting the Earth’s magnetic field with the solar wind. Particles are channeled through these ropes, which last a short time, and are focused in certain regions, boosting the energy of the Aurora Borealis. The magnetopause is where the Earth’s magnetic field meets the solar wind. Electromagnetic explosions were also observed by THEMIS at the bow shock of the Earth’s magnetic field. The bow shock is where the magnetosphere bunches up as the Earth travels through space, kind of like how the waves in the front of a boat moving through the water are closer together than those behind the boat. The results were presented at the meeting of the American Geophysical Union in San Francisco this month. THEMIS will continue to observe the Aurora Borealis over the next two years, taking measurements of ions, electrons and electromagnetic radiation in space. Scientists from the US, Canada, Western Europe, Russia and Japan are contributing to the study of Earth’s own Christmas lights. Cancer is a mysterious and complicated disease, with many different types and causes. Researchers are still trying to track down all of the environmental effects that can lead to the disease, as anything from what someone eats to where they live determines the probability of developing cancer. A paper published in 2007 in the International Journal of Astrobiology looked at data for cancer deaths from around the world for the past 140 years, and found a strong correlation between rises in cancer deaths and the variation over time in the amount of galactic cosmic rays we encounter here on Earth. In a paper titled, Correlation of a 140-year global time signature in cancer mortality birth cohorts with galactic cosmic ray variation by Dr. David A. Juckett from the Barros Research Institute at Michigan State University, he showed that the amount of deaths due to cancer on a global scale was higher when the background cosmic rays originating from outside the Solar System were more numerous. The study looked at available cancer death data from the United States, United Kingdom, Australia, Canada and New Zealand for the past 100-140 years. These data were compared with the amount of variations in galactic cosmic rays during the same period, taken from analysis of ice core samples from Greenland and Antarctica. Dr. Juckett showed that as the amount of cosmic ray activity increased, the number of people who died from cancer was also higher. There are two peaks in cosmic ray activity during this point, around 1800 and 1900, and a low point around 1860. The total deaths due to cancer were highest, though, around 1830 and 1930, and lowest in the 1890’s. There is a 28-year lag between the increased presence of cosmic rays and the increase in cancer deaths. It’s not so simple as a person being exposed to cosmic rays and then developing cancer immediately afterwards. What is called the “grandmother effect” comes into play; the cosmic rays actually damage the germ cells of one’s parent while that parent is still in the grandmother’s womb. “The grandmother would have to be exposed to radiation – which she is all the time – while she is pregnant with the mother of the affected individual. What this is basically implying is that, during a sensitive time in pregnancy, the constant background radiation may cause a chemical change in just the right cell and DNA stretch to lead to future cancer. The background radiation is causing very low level damage all the time to random cells in the body, but anything significant happening to germ cells would lead to a whole organism eventually carrying that damage (or predisposition),” said Dr. Juckett. So, the parent is exposed to cosmic rays while the fetus is still developing, and this damage then emerges as cancer in child, but is not passed down further. Galactic cosmic rays consist of high-energy radiation, and are composed primarily of high-energy protons and atomic nuclei. Their origin in not fully understood, but are thought to possibly come from supernovae, active galactic nuclei, quasars and/or gamma ray bursts. 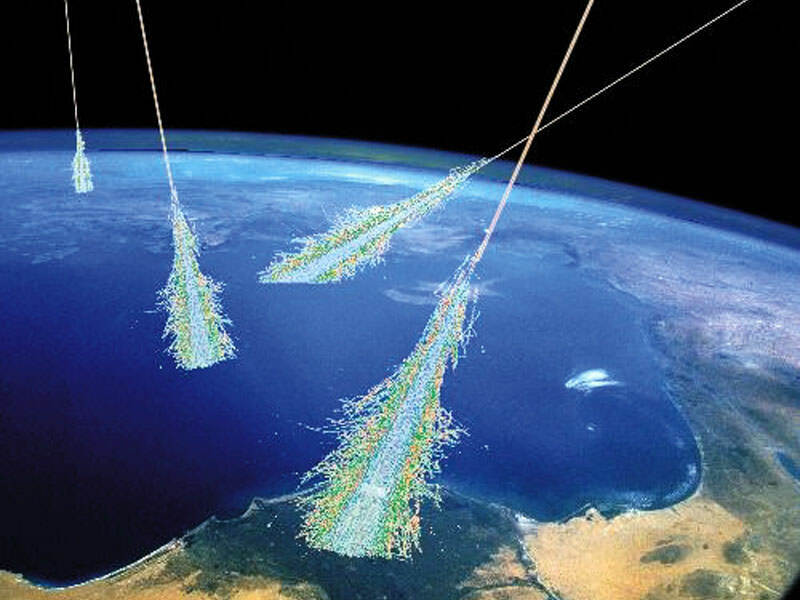 There are several factors that may contribute to the flux of cosmic rays, and they may produce showers of secondary particles that penetrate and impact the Earth’s atmosphere and sometimes reach the surface. In the study, the researchers found the trend between cosmic ray increase and cancer death increase was a global effect, but there are places on the Earth where the magnetosphere blocks more of the cosmic rays than others. At about 10°N of the equator, fewer cosmic rays get through than elsewhere on the Earth because of the way the Earth’s magnetosphere blocks energetic particles. People in more northern and southern latitudes are exposed to more of this radiation, thus the rates of cancer death were higher in these regions than near the equator. On average, the oscillation in cancer deaths was between 10-15% during the period of the study. Any good scientist will tell you that correlation does not necessarily mean causation; the increase in cosmic rays matches well the increase in cancer deaths over this time period, but there could yet be other reasons for this increase. The effects that cosmic rays and other types of radiation have on human beings are important to study, as we venture outside the protective magnetic field of the Earth into space. The researchers said that “this effect has profound implications for evolution, long-distance space travel and the colonization of planets with high background radiation.” Long journeys in space would expose astronauts to this same type of radiation for long periods of time, so taking precautions to protect them makes good sense. What can one do to protect themselves from this type of radiation here on Earth? “I cannot of think of anything one can do to protect themselves from their inherited propensities. However, cancer is a multi-step process. It still requires other random ‘mutations’ to occur during life. Healthy living is still called for. In other words, reducing exposure to toxins, radiation, and injury. Eventually, the biochemical fingerprints of possible inherited changes may be deciphered and then testing could be possible,” said Dr. Juckett. There is no cause for alarm, though; cosmic rays are only about 20-30% of the background radiation we are exposed to every day, and are a minimal cause of cancer in comparison to other environmental effects such as smoking. Take a nice deep breath, fill your lungs with oxygen. You can thank the plants for that. Scientists had originally found that oxygen showed up in the Earth’s atmosphere around 2.3-2.4 billion years ago; in a period called the “Great Oxidation Event”. But there’s new evidence, dug out of a rock in Australia, that puts that first date even earlier by 50-100 million years. Researchers gathered samples from a region of Western Australia called Hamersley Basin. In one part of the kilometre-long rock sample, they found an ancient rock that shows how the atmosphere was switching over to the oxygen-rich air we enjoy today. Their research appeared in the September 28th issue of the journal Science. During the summer of 2004, researchers bored a 1 km long sample of rock out of Hamersley Basin in Western Australia, a region famous for keeping a geologic history of the Earth. Because the sample was so deep underground, it had been untouched for billions of years. The researchers sliced the sample and kept half in Australia, and took the other half back to the US. They began to analyze ancient portions of the sample, looking for the trace metals molybdenum, rhenium and uranium. The amount of these metals found in ocean deposits depends on the amount of oxygen in the atmosphere. They found a region of time, ahead of the Great Oxidizing Event by about 100 million years, where oxygen was forming in the atmosphere. It’s thought that life started learning how to produce oxygen then, but everything that made was soaked up by geologic processes. It took 100 million years for the life to overcome those effects and start seeding the atmosphere with oxygen. Of course, this discovery will help astronomers search for life on other planets in the galaxy. They will eventually be able to measure the oxygen content precisely, and identify what stage of evolution life on the distant planet could be at. If none have undergone a similar Great Oxidation Event, it tells us how rare life might be in the Universe. Iron meteorites are probably the surviving fragments of the long-lost asteroid-like bodies that formed the Earth and other nearby rocky planets, according to researchers from Southwest Research Institute (SwRI) and Observatoire de la Cote d’Azur in Nice, France. Their findings are described in the Feb.16 issue of Nature. “While the amount of material reaching the asteroid belt was limited, much of it was placed in regions likely to produce meteorites,” says SwRI Research Scientist Dr. David Nesvorn??bf?. En route to the asteroid belt, the parent bodies of the iron meteorites were repeatedly bashed by other bodies, allowing core fragments from numerous bodies to escape. “This could explain the many differences seen among iron meteorites,” says Dr. David O’Brien of the Observatoire de la Cote d’Azur. If humans continue to use fossil fuels in a business-as-usual manner for the next few centuries, the polar ice caps will be depleted, ocean sea levels will rise by seven meters and median air temperatures will soar to 14.5 degrees warmer than current day. These are the stunning results of climate and carbon cycle model simulations conducted by scientists at Lawrence Livermore National Laboratory. By using a coupled climate and carbon cycle model to look at global climate and carbon cycle changes, the scientists found that the earth would warm by 8 degrees Celsius (14.5 degrees Fahrenheit) if humans use the entire planet’s available fossil fuels by the year 2300. The jump in temperature would have alarming consequences for the polar ice caps and the ocean, said lead author Govindasamy Bala of the Laboratory’s Energy and Environment Directorate. In the polar regions alone, the temperature would spike more than 20 degrees Celsius, forcing the land in the region to change from ice and tundra to boreal forests. “The temperature estimate is actually conservative because the model didn’t take into consideration changing land use such as deforestation and build-out of cities into outlying wilderness areas,” Bala said. Today’s level of atmospheric carbon dioxide is 380 parts per million (ppm). By the year 2300, the model predicts that amount would nearly quadruple to 1,423 ppm. In the simulations, soil and living biomass are net carbon sinks, which would extract a significant amount of carbon dioxide that otherwise would remain in the atmosphere from the burning of fossil fuels. The real scenario, however, might be a bit different. The model shows that ocean uptake of CO² begins to decrease in the 22nd and 23rd centuries due to the warming of the ocean surface that drives CO² fluctuations out of the ocean. It takes longer for the ocean to absorb CO² than biomass and soil. By the year 2300, about 38 percent and 17 percent of the carbon dioxide released from the burning of all fossil fuels are taken up by land and the ocean, respectively. The remaining 45 percent stays in the atmosphere. Whether carbon dioxide is released in the atmosphere or the ocean, eventually about 80 percent of CO² will end up in the ocean in a form that will make the ocean more acidic. While the carbon dioxide is in the atmosphere, it could produce adverse climate change. When it enters the ocean, the acidification could be harmful to marine life. The models predict quite a drastic change not only in the temperature of the oceans but also in its acidity content, which would become especially harmful for marine organisms with shells and skeletal material made out of calcium carbonate. Calcium carbonate organisms, such as coral, serve as climate stabilizers. When the organisms die, their carbonate shells and skeletons settle to the ocean floor, where some dissolve and some are buried in sediments. These deposits help regulate the chemistry of the ocean and the amount of carbon dioxide in the atmosphere. Earlier Livermore research, however, found that unrestrained release of fossil-fuel carbon dioxide to the atmosphere could threaten extinction for these climate-stabilizing marine organisms. “The doubled-CO² climate that scientists have warned about for decades is beginning to look like a goal we might attain if we work hard to limit CO² emissions, rather than the terrible outcome that might occur if we do nothing,” said Ken Caldeira of the Department of Global Ecology at the Carnegie Institution and one of the other authors. Bala said the most drastic changes during the 300-year period would be during the 22nd century, when precipitation change, an increase in atmospheric precipitable water and a decrease in sea ice size are the largest and when emissions rates are the highest. According to the model, sea ice cover disappears almost completely in the northern hemisphere by the year 2150 during northern hemisphere summers. As for global warming skeptics, Bala said the proof is already evident. He pointed to the 2003 European heat wave and the 2005 Atlantic hurricane season as examples of extreme climate change. Other Livermore authors include Arthur Mirin and Michael Wickett, along with Christine Delire of ISE-M at the Université Montepellier II. The research appears in the Nov. 1 issue of the American Meteorological Society’s Journal of Climate. Pamela Conrad, an astrobiologist with NASA’s Jet Propulsion Laboratory, has traveled to the ends of the Earth to study life. Conrad recently appeared in James Cameron’s 3-D documentary “Aliens of the Deep,” where she and several other scientists investigated strange creatures that inhabit the ocean floor. In part 1 of this edited transcript, Conrad describes what sort of signs we could look for to see if there is life in an alien environment. “In the past three years, I’ve been engaged in a project with several of my colleagues that takes us to hot and cold deserts. We want to observe the signatures of life, and see if we can tell the difference between places where life is and where life isn’t. The reason we go to deserts is to cut down on the number of confounding variables that are introduced by all kinds of life. Basically, we don’t want to be scraping away the dog poop to find the bacteria in the dirt. This past year we were privileged to go to both the Arctic and the Antarctic. So this is my bipolar year, and what we were doing there is relevant to space exploration because, like a desert, the conditions on the surface of other planets are very harsh. We look at rocks because, if life had been and is already gone – in other words, it’s dead, or it’s so dead it’s been fossilized and altered – you can find that in the rock record. To detect life anywhere, you need to be able to investigate the environment and find measurable clues. If it’s not something you can define in measurable terms, it’s not science. So by definition, we’re kind of out in the cold, so to speak. One of the challenges is coming up with measurable terms by which you could define life. The terms have to be universal enough to not miss life on another planet, if it was unlike the life we have here. We have a sample set of one: the biosphere on the Earth. We try to use the knowledge we have about life here to come up with those terms, and so we try to think about life in the most general descriptive terms we can. We look for life in places that are habitable; places that are capable of supporting life. But habitability is difficult to define, because we only have a vague notion of what makes an environment habitable. At NASA, we’re very big on looking for water as one of the facets of habitability. Water is as important to life in the desert as it is to us. After a fresh snowfall, when rocks get heated up and melt the ice, you see a bloom of cyanobacteria on the surface of the rock. Yet they are able to maintain a minimal existence when there’s not much precipitation. One reason metabolism has to slow down in the Antarctic winter is because the water is in a solid phase and it’s not accessible. Living things can only use ice when it melts and becomes a good solvent. Using ice is like using a mineral in the crystal phase — when it’s in the solid form, you’ve got to use some energy to bust up those bonds to do something with it. There are organisms in Antarctica that have antifreeze types of molecules in them, fish that possess molecules called glycoproteins. When an ice crystal forms in the fish, the molecule grabs hold of the ice crystal as it starts to grow, and doesn’t let it grow in the direction that its energetically most easily grown. Because it can’t grow, the ice crystal gives up the ghost and turns back into water. Besides water, we think that certain kinds of chemical elements are important for life elsewhere. Life on Earth is made of carbon and hydrogen and phosphorus and a few other important things, and we need the oxygen in the air. But there are microbes on Earth that breathe metal, and they don’t care about oxygen. So habitability is really habitable in the eyes of the beholder. When you’re defining it, you’ve got to think about the broadest set of terms you can in order to encompass any kind of life you might be able to imagine. The ultimate assessment of whether a place is habitable is, of course, to see if it is inhabited. You ask one set of questions if you want to know, “Can I set up housekeeping here?” You might ask another set of questions if you want to know, “Is anybody home?” But at the heart of it all, whether or want to live there or just see if anyone’s home, you have to know something about the neighborhood. You’ve still got to do all the experiments that tell you about the geophysical, mineralogical, and atmospheric properties of the planet. If you’re looking for life, you’ve got to have some notion about what sort of thing you’re trying to support with that environment. So what would constitute proof? If you want to say that something has been proven, you have to achieve a certain level of consensus in the scientific community, otherwise your peers will tear you into little bits and pieces in the literature. Of course, there is never a complete consensus: that’s why we nasty scientists fight with each other endlessly. But we have to at least come up with terms. We can agree or disagree with each other’s theories, but we have to agree on the terms and the measurements. So what kind of measurements could we make if we were looking for life? Does a planet look different if life has been there? For example, if you go into my kitchen after I’ve eaten, you might see a plate or a crumb. That’s a clue that I was there. There are clues at the planetary level too. A biomarker – a clue that says life was there – can be anything that was produced by life. The clue can be chemical, because chemicals comprise everything. I am a sack of chemicals, just like this podium is a sack of chemicals. Just what chemicals there are, and in what proportion to each other, and how they’re arranged in 3-D, is what distinguishes me from this. It’s a simple way of distinguishing categories of things. Chirality is a biomarker as well. What chirality means is that some molecules are mirror images of each other, and the living molecules tend to be a certain handedness. When it comes to amino acids, which are the constituents of the proteins that make up life, living things like to use the left-handed form. And when it comes to the sugars, living things like to use the right-handed form. There are exceptions to these, but that’s a general case. Isotopes also can be a biomarker. Some molecules come in different isotopic flavors, where some are slightly heavier than others. Living things like the lighter variety, probably because it’s energetically less expensive to process. Complex polymers also could be biomarkers. Of course, plastic is a complex polymer. The again, we made the plastic. So this whole distinction between natural and unnatural – if humans made it, it’s still biogenic. So think about that. My car is a biosignature. What kind, I’m not sure. If you’re going to define life in measurable terms, I’d like to keep it really simple. You could define life by what it’s made of, or you could define life by what it does. I like to define life by what it’s made of, because as soon as you say the “does” word, you’re talking about a process. A process is something that happens through time. Then you’ve got to figure out what the sampling rate should be. How often should you look, and how long should the whole experiment take? A process is a little more problematic because it takes time, and you may be wrong about how often to look, or how long you should look for. Processes – making stuff, reproducing, or evolving – can take place over different time scales. So if you’re only looking at processes, and you have two that are vastly different in their time scales, you won’t be able to do the same experiment to look at them both. So I like to look at life in terms of what it is. Not to say we couldn’t add in a little bit of process-based stuff, but when you look at what life is, it gets simple really fast. It’s unique chemistry, some kind of proportionate chemicals, arranged in some way, and the “arranged in some way” is what I call structure. If I were looking for life on another planet or a moon, I would look for places where interesting chemistry could happen, so that the ultimate evolution of that chemistry could create a living system. I would think about places like Europa, which has an ocean beneath ice. I would think about other places where ice exists, like comets. I would think about Titan, Saturn’s moon. I would think about all those places where interesting chemistry occurs, because chemistry is clever. You can get all kinds of interesting molecules. Earth’s land at the time was still massed in a supercontinent called Pangea, and most of the land above sea level became uninhabitable because low oxygen made breathing too difficult for most organisms to survive, said Raymond Huey, a UW biology professor. What’s more, in many cases nearby populations of the same species were cut off from each other because even low-altitude passes had insufficient oxygen to allow animals to cross from one valley to the next. That population fragmentation likely increased the extinction rate and slowed recovery following the mass extinction, Huey said. “Biologists have previously thought about the physiological consequences of low oxygen levels during the late Permian period, but not about these biogeographical ones,” he said. “Oxygen dropped from its highest level to its lowest level ever in only 20 million years, which is quite rapid, and animals that once were able to cross mountain passes quite easily suddenly had their movements severely restricted,” Huey said. Huey and UW paleontologist Peter Ward are authors of a paper detailing the work, published in the April 15 edition of the journal Science. The work was supported by grants from the National Science Foundation and the National Aeronautics and Space Administration’s Astrobiology Institute. Ward was lead author of a paper published in Science earlier this year presenting evidence that extinction rates of land vertebrates were elevated throughout the late Permian, likely because of climate change, and culminated in a mass extinction at the end of the Permian. The event, often called “the Great Dying,” was the greatest mass extinction in Earth’s history, killing 90 percent of all marine life and nearly three-quarters of land plants and animals. Ward said paleontologists had previously assumed that Pangea was not just a supercontinent but also a “superhighway” on which species would have encountered few roadblocks while moving from one place to another. For the last three years evidence has been building that the impact of a comet or asteroid triggered the biggest mass extinction in Earth history, but new research from a team headed by a University of Washington scientist disputes that notion. In a paper published Jan. 20 by Science Express, the online version of the journal Science, the researchers say they have found no evidence for an impact at the time of “the Great Dying” 250 million years ago. Instead, their research indicates the culprit might have been atmospheric warming because of greenhouse gases triggered by erupting volcanoes. The extinction occurred at the boundary between the Permian and Triassic periods at a time when all land was concentrated in a supercontinent called Pangea. The Great Dying is considered the biggest catastrophe in the history of life on Earth, with 90 percent of all marine life and nearly three-quarters of land-based plant and animal life going extinct. The paper is to be published in the print edition of Science in a few weeks. Co-authors are Roger Buick and Geoffrey Garrison of the UW; Jennifer Botha and Roger Smith of the South African Museum; Joseph Kirschvink of the California Institute of Technology; Michael De Kock of Rand Afrikaans University in South Africa; and Douglas Erwin of the Smithsonian Institution. The Karoo Basin of South Africa has provided the most intensively studied record of Permian-Triassic vertebrate fossils. In their work, the researchers were able to use chemical, biological and magnetic evidence to correlate sedimentary layers in the Karoo to similar layers in China that previous research has tied to the marine extinction at the end of the Permian period. Evidence from the marine extinction is “eerily similar” to what the researchers found in the Karoo Basin, Ward said. Over seven years, they collected 126 reptile or amphibian skulls from a nearly 1,000-foot thick section of exposed Karoo sediment deposits from the time of the extinction. They found two patterns, one showing gradual extinction over about 10 million years leading up to the boundary between the Permian and Triassic periods, and the other for a sharp increase in extinction rate at the boundary that then lasted another 5 million years. The scientists said they found nothing in the Karoo that would indicate a body such as an asteroid hit around the time of the extinction, though they looked specifically for impact clays or material ejected from a crater left by such an impact. They contend that if there was a comet or asteroid impact, it was a minor element of the Permian extinction. Evidence from the Karoo, they said, is consistent with a mass extinction resulting from catastrophic ecosystem changes over a long time scale, not sudden changes associated with an impact. The work, funded by the National Aeronautics and Space Administration’s Astrobiology Institute, the National Science Foundation and the National Research Foundation of South Africa, provides a glimpse of what can happen with long-term climate warming, Ward said. In this case, there is ample evidence that the world got much warmer over a long period because of continuous volcanic eruptions in an area known as the Siberian Traps. As volcanism warmed the planet, large stores of methane gas frozen on the ocean floor might have been released to trigger runaway greenhouse warming, Ward said. But evidence suggests that species began dying out gradually as the planet warmed until conditions reached a critical threshold beyond which most species could not survive. He noted that the normal atmospheric oxygen level is around 21 percent, but evidence indicates that at the time of the Great Dying it dropped to about 16 percent — the equivalent of trying to breathe at the top of a 14,000-foot mountain.